Since his introduction to the mainstream* Star Wars audience in The Empire Strikes Back, Mandalorian bounty hunter Boba Fett has become an iconic character. Known to Darth Vader for disintegrating his bounties rather than handing them back alive, we're pretty sure the character is so popular because of the awesome Mandalorian Armour and the great color palette which adorns it. That Clint Eastwood vibe certainly helps too! Given Boba's popularity, when George Lucas took the opportunity to make the prequels he chose to expand on the legacy of the Fett family by showing how Jango Fett's DNA was used for the Clone Army and that he kept a separate clone for himself, one that had been produced to not age as the other clones. This clone is of course his son, Boba. The first and quite famous for it, Jeremy Bulloch, from the Empire Strikes Back and Return of the Jedi. Bulloch recently retired from the convention circuit. We think he'd earned a fair break! Daniel Logan played the young version of Boba in the Attack of the Clones prequel and the voice of the animated Boba in the three-part Season Two finale and in Season Four of the Star Wars: The Clone Wars television series. Logan milks his role on the convention circuit as much as he can! Dickey Beer, was stunt performer in Return of the Jedi. This involved the work in the Sarlacc Pit scene and Fett flying into the side of Jabba's Sail Barge. John Morton did a quick turn in a Cloud City scene in The Empire Strikes Back. Temuera Morrison, played father of Boba, Jango Fett in Attack of the Clones. He's the dude who bought a gun to a lightsaber fight with Mace Windu! To ber fair, Jango's Jet Pack misfired meaning he had no chance of defending himself by escaping Mace's purple power pulping device! 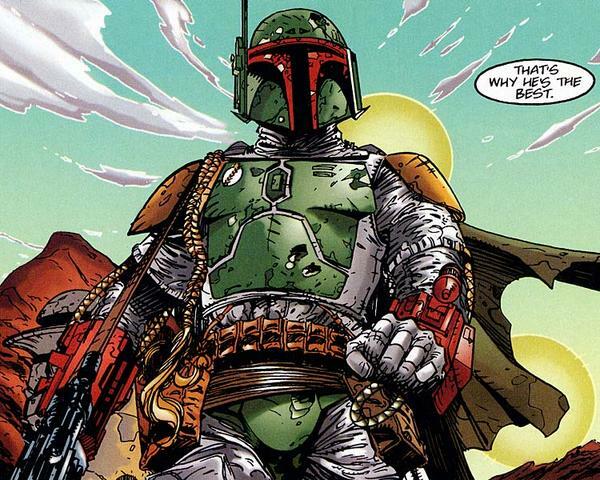 * Boba was first shown in the television movie, known as the Holiday Special. He featured in a cartoon segment. Here's all the actors who've ever played a Fett character being interviewed by Warwick Davis during a recent Star Wars Celebration Event.